A gallery wall in the Marais district. 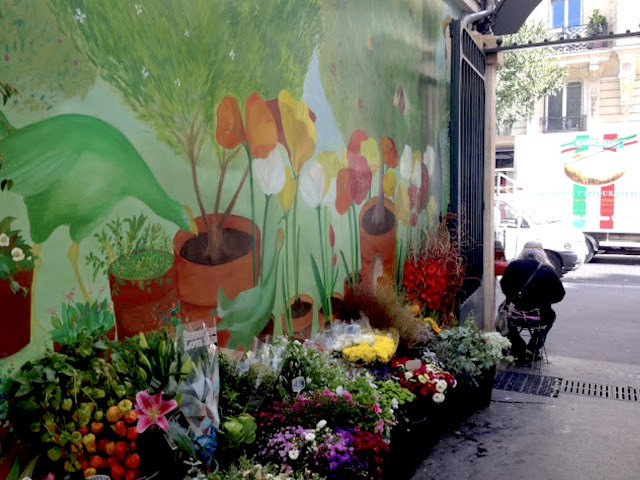 Open Tuesdays, Fridays, and Sundays when it's a marché biologique (organic), this Left Bank market goes on for blocks. 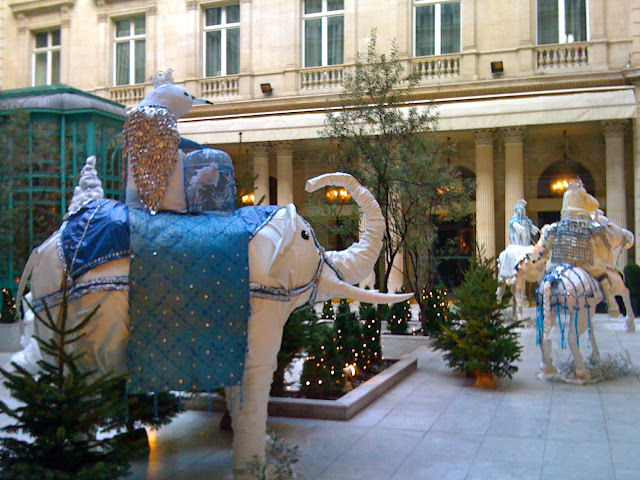 This year's holiday window display theme at Galeries Lafayette department store is all about the new Star Wars movie. Classical side view of Notre Dame Cathedral as seen from across the river. No Christmas table was complete without its Bûche de Noël, the traditional Yule Log dessert, and every bakery and pâtisserie was well stocked. New York style bagel shops have sprung up around Paris. Today's bagel at this one in Montmartre, "Christmas spices." Life-sized figurines made of silk, satin and brocade decorate the courtyard of a luxury hotel. As soon as it gets dark festive lights appear in corners, lining entire streets overhead. It's a strange sensation to walk down familiar streets and see photos of the dead; neighbors, familiar faces posted in doorways where they lived. Whimsical tote bags by Barbara Rihl flirt from a shop window on a side street in the fashion district. A photograph of the Basilica of Sacre Coeur covers an entire wall of this Montmartre bakery. A coiffeur-barbier poses in front of his newly-opened shop. This corner sweets stall is a permanent fixture year round, rain or shine, on Boulevard Saint Germain near Odéon. Details such as the tiny oval window on one side, make this door unique. Big Tobacco is thriving as evidenced by the many brands on offer at any corner tabac, the most popular by far being Marlboro. 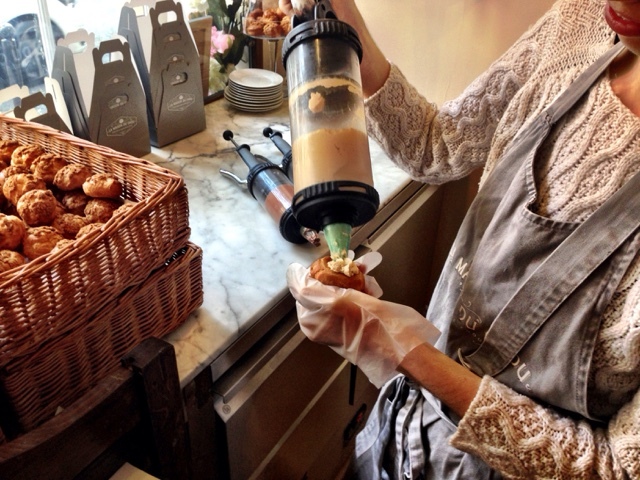 At La Maison du Chou flavored cream fillings are pumped into airy choux before your eyes using a pastry syringe. 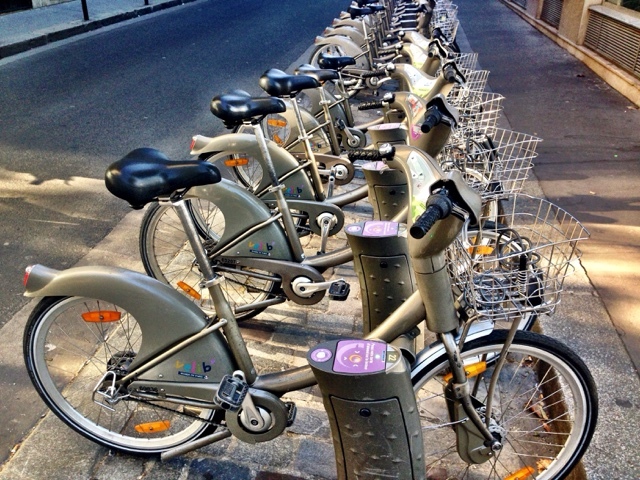 A lineup of Velibs', Paris' popular rent-a-bikes. Buildings behind this métro sign create a sharp angle at the exit. The Marché des Enfants Rouges covered market dates to the 1600's and is named for orphans dressed in red. The latest "smart car" is an efficient way to buzz through narrow city streets. The tranquil beauty of this Left Bank square never fails to stop me in my tracks. 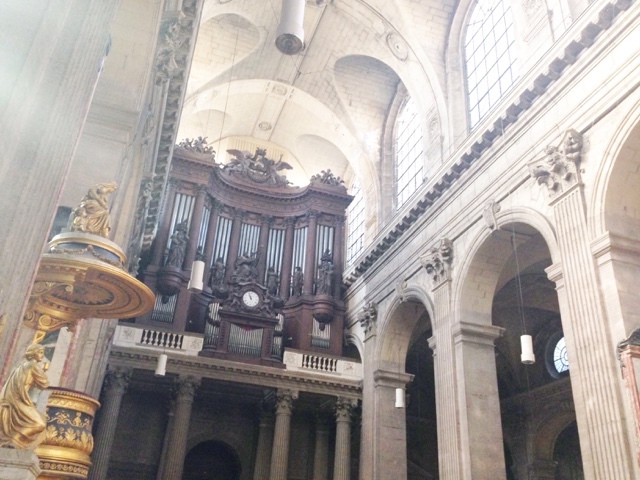 The massive Cavaillé-Coll organ dominates the interior of the Church of Saint Sulpice. 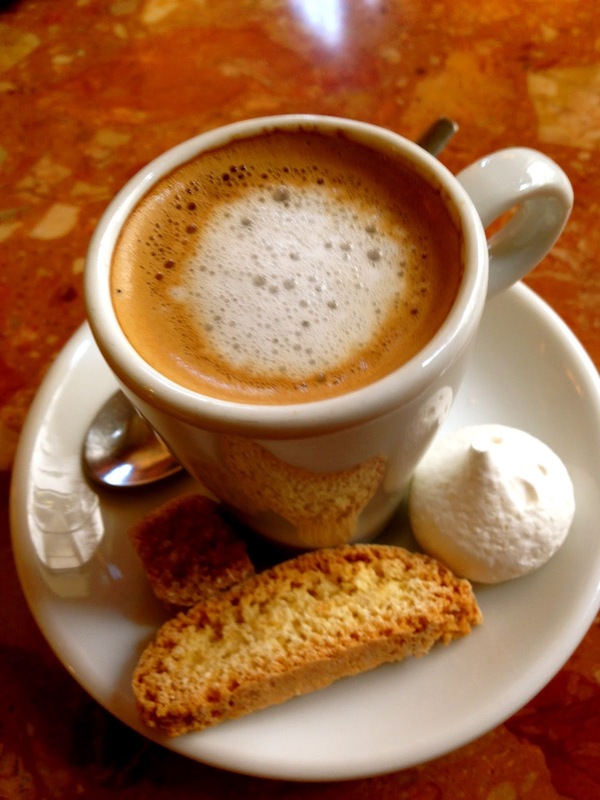 This is the French version of Spain's café cortado, an espresso to which a drop of milk the size of a hazelnut (noisette) has been added. 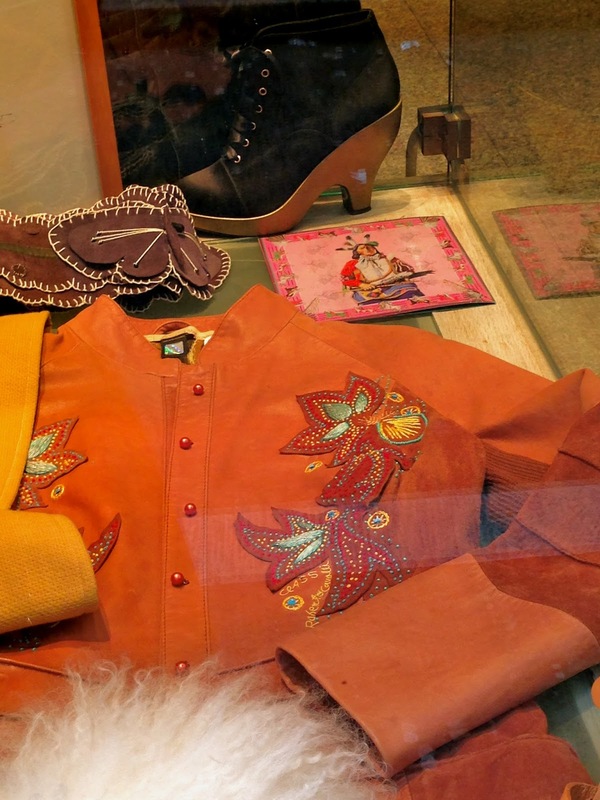 In Paris, experimenting with and discovering one's own personal style is de rigeur. 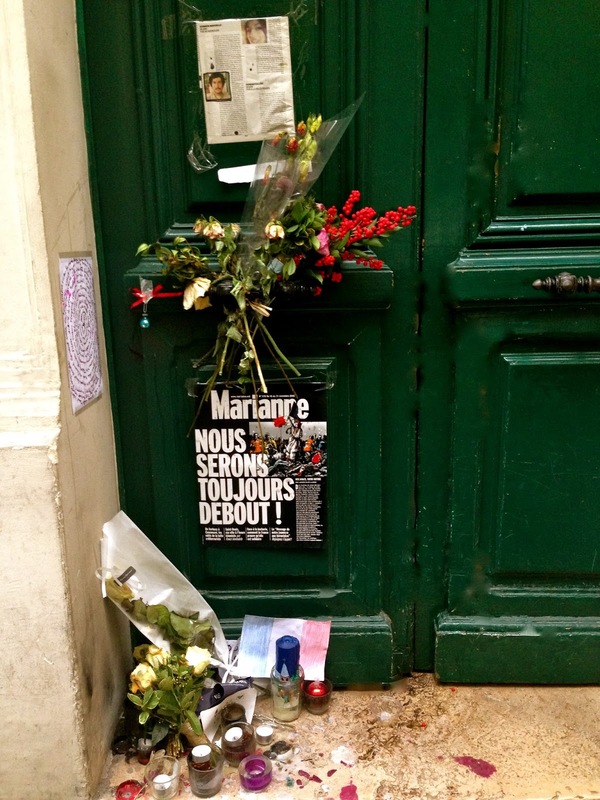 Montmartre often surprises with quiet passageways and byways lined by single family homes and artists' studios. Fall foliage illuminates this street on an overcast day. A stairway to the street where Vincent Van Gogh lived with his brother Theo in Paris. Walkway to a hidden hotel, once a private home. 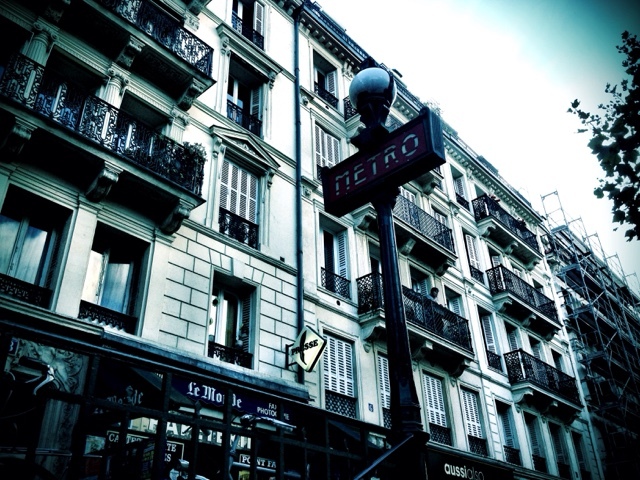 New York chef Anthony Bourdain stayed here while filming in Paris. Scattered leaves and a parked bicycle. It's early and below, in the distance, a boulangerie and café opens for business. 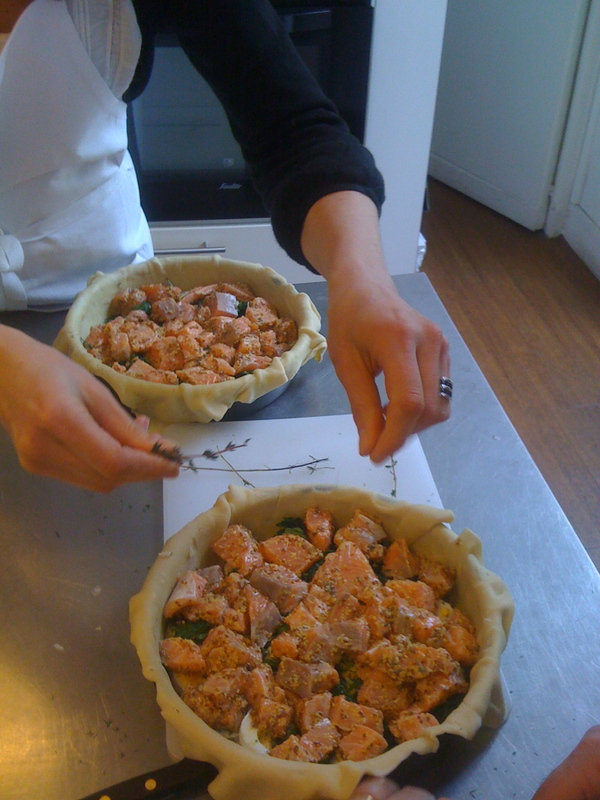 To past Thanksgivings and Thanksgivings yet to come, a very happy one wherever you are. Above: the table is set as fireplaces and candles are lit in anticipation of sit-down dinner. - Châteauneuf-en-Auxois, Burgundy, "one of France's most beautiful villages"
Golden leaves carpet sidewalks and squares everywhere. Fall colors seem to be more intense in Montmartre, the hilltop village of tree-lined streets that abruptly rises out of the city. A street corner band at a market in the Latin Quarter district performs every weekend, brightening up winter days. Usually this café, heat lamps on, gets so busy at lunchtime that it has to turn customers away. A woman walking her dog heads home up these stairs. 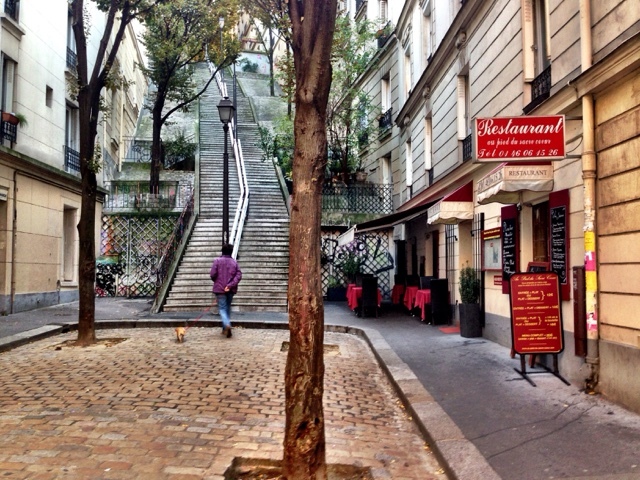 A steep stairway, one of many on the slopes of Montmartre. A place looks onto the street where artist Toulouse Lautrec lived in Montmartre.